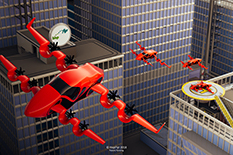 A new collaboration between Lusby, Maryland-based HopFlyt Corporation and Assistant Professor Huan Xu seeks to reduce commuting time and traffic with the development of an air vehicle that aims to “hop” over traffic for distances up to 30 miles, carrying up to three passengers at a time. The new project envisions reducing the 90-minute drive from Baltimore to Washington, D.C. during rush hour to just 15 minutes. The highly autonomous but piloted vehicle, called the Venturi, will take off and land like a helicopter and fly like an airplane, according to HopFlyt CEO and Chief Design Engineer Rob Winston. The Venturi is all-electric, with 16 motors that adjust to make flight smooth for passengers. It gains efficiency, Winston explained, by eliminating control surfaces such as the hinged part of a wing used to provide balance. Instead, the Venturi will tilt its wings and adjust power in its motors to steady its flight. Xu’s project with HopFlyt is supported by $100,000 in joint funding from the Maryland Industrial Partnerships (MIPS) program, an initiative of the Maryland Technology Enterprise Institute (Mtech) in the A. James Clark School of Engineering, and the company. MIPS supports technology development projects that team Maryland companies with University System of Maryland faculty. HopFlyt also received a $25,000 pre-seed investment through the Technology Development Corporation (TEDCO) Rural Business Innovation Initiative.